Sorry for not posting for so long but this time I have an excuse. I have been trying to change over from using paper bookkeeping to computer bookkeeping. It is a noble endeavor but all that data entry is sucking the life out of me. Changing to computerized bookkeeping is only the start. This seems to be the year that I'm going to be upgrading the shop in a lot of ways. My next project is adding some more shelves. This is the area of the shop right by the counter. It has looked like this since I opened. Not very tidy and not the best use of space. So, I went out and got these. These are two seven foot high by two foot wide shelving units. Now, one can't just get shelves this tall and narrow without securing them to the wall. So, I got all DIY with it! Any excuse to use my electric drill is a good one! First, I attached some strapping to the wall. Then I realized that it might have been a good idea to measure how high it was. Fortunately, lowering it only took a couple of minutes. I didn't want to block off one of the only accessable outlets in the room so I got myself a power strip. It actually took me two tries to get one with a flat plug. The first one had a sticky-outy plug and that wouldn't do at all. away. Wouldn't you know, as soon as I get ahead of that batch, more shows up! By, hey, I'm not mad. That done, the next big upgrade is coming after Labor Day. 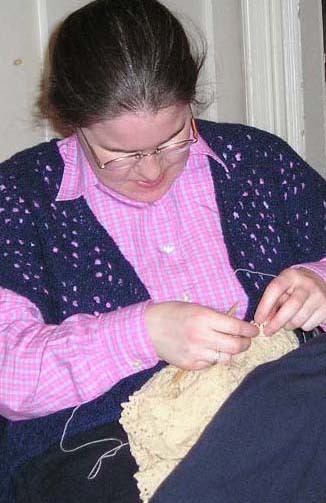 I've hired the lovely and talented Annie, knitter, spinner and veteran of many stints of covering the shop. That's right folks, after eleven years in business, I'm hiring my first employee! With Annie's help, the shop will be open seven days a week starting after Labor Day! More upgrades are coming but may take longer. I'll keep you posted! Sweet! The new shelves look great, and yay for being open 7 days a week! Wheee! and Haw! Growth is good! Does this mean we all need to come in and buy more yarn to support the expansion? yay! looks great. is that yarn on the brain 2.0?